When you visit the Dicky Beach Family Meats website, our Web server automatically records some general information about your visit, but does not recognise or record any individual information about you. The information we record is used for statistical purposes and includes the date, time and duration of visits and which pages of this website are most commonly accessed. This information is used by us to help to administer and improve the website. Any messages or comments you submit to us via this website, which may include personal data such as your name, email address and telephone number. Any information that you send to us may be shared within Dicky Beach Family Meats for purposes of responding to your request for information; responding to your feedback; or where you have provided us with your order details. Additionally, the message content may be monitored for purposes including compliance auditing and maintenance or where email abuse is suspected. Dicky Beach Family Meats do not share your personal information with others except under these conditions, and we do not disclose or sell your personal information to others for use in mailing lists or databases. Dicky Beach Family Meats may share your information with a relevant third party if we suspect that fraud or unlawful activity is being or may be engaged in. This website does not currently use "cookies" to gather or store any information. Dicky Beach Family Meats use a number of mechanisms to protect the security and integrity of personal data. Unfortunately, no data transmission over the Internet can be guaranteed as completely secure. So while we strive to protect such information, we cannot ensure or warrant the security of any information transmitted to us and individuals do so at their own risk. 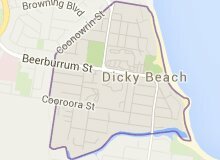 Dicky Beach Family Meats provides this website for your convenience only. Neither Dicky Beach Family Meats, nor its affiliates, managing directors, partners, employees or other representatives, warrant that the Site will be uninterrupted or error-free. Specials are valid while stocks last.